Words of Affirmation, Gifts, Physical Touch, Quality Time, and Acts of Service. And of those five, one of them is your primary love language. 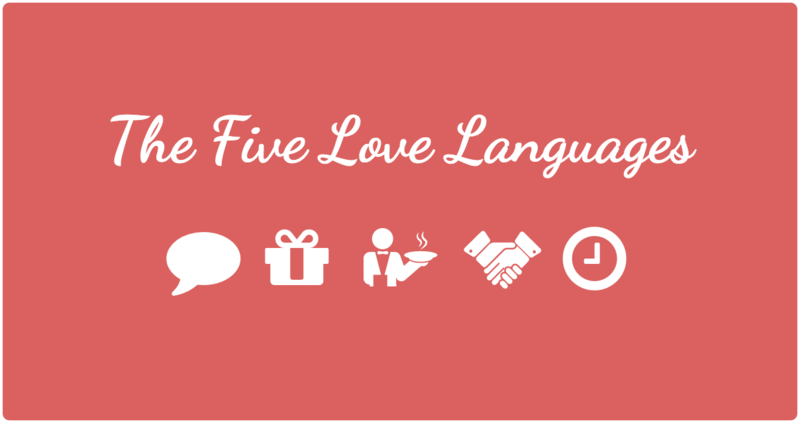 And it doesn’t matter if it’s a romantic relationship, parents, children, extended family, or friends–You tend to give and receive love with one of these five languages. What’s made this such a helpful series for so many people sitting around you is because you can learn to become fluent in another love language. And when you stop feeling rejected by the people in your life because you’re speaking past each other with your different love languages, you begin communicating with each other’s love language, that transforms the emotional climate in a home. This week we close out our series by talking about the fifth and final love language–Acts of Service. Inconveniencing yourself by doing something for the convenience of another. Serving them. Except when it doesn’t, in which case you’d call and leave a complaint with Customer Service. You may pay for service from a business, but in a relationship, the love language of service is always free of charge, no strings attached. And it’s usually not your responsibility. It’s going out of the way to do something for someone. In the home this is helping with chores like dishes. Taking out the trash. Vacuuming. If you’re married to someone who has the love language of acts of service, helping out with chores is steps 1, 2, and 3 of foreplay. But it’s not just limited to romance. Kids making mom breakfast or mowing, or friends shoveling snow from your sidewalk says “I love you” loud and clear. The person with service as their love language usually does this without you around. Because for them they love the anticipation of when you turn on the lights and go-ah, you did the dishes! What is the ultimate way someone can show you they love you through service? A couple hints. If you live in a house with a person who just raised their hand–if you leave a mess in a place where they just cleaned isn’t just frustrating, it’s actually a rejection of their love. For those of you who struggle with the love language of service? Don’t always think of a big one-time thing you can do, look for something small and repeatable that you can do. Like I’m going to make a habit to pick up my shoes at the end of the night. I’m going to always clean off the bathroom counter each morning. My advice? Make a game out of it. And the game is, see how long it takes for you to consistently do this small thing before the person your serving notices. “I noticed… you’ve been shutting the cupboard doors.” And then, “Thank you.” Ahh, pay off. We’re not perfect, but it definitely was loving another better by loving them in the way they most-feel love. And it’s not just true of people, it’s true with God. Each week in our series we’ve not only looked at how service applies to our relationships with people, but God has loved us and WE CAN LOVE GOD with each of the love languages. Words, Gifts, Touch, Time but–service? Do you realize how insanely unique it is the the Christian faith that the supreme, Almighty God who lives and reigns forever, who makes galaxies with the wave of his hand, and how crazy it is that He… would place Himself beneath you and… serve you? I can fathom a God who graces me with His presence and spends quality time with me. I can wrap my head around a God who gives me gifts. But a God… who serves… me as my inferior? But that’s exactly what Jesus did. Did you know the prophet Isaiah, hundreds of years before Jesus, prophesied that when the Messiah came, he would be among us as a suffering servant? The aspiration in the ancient world was just like our world today–celebrate the celebrities. To have people cheer when you were around. To have the wealth and power and finest clothes and most luxurious homes. To the ancient world, serving someone wasn’t a compliment. It was an insult to be a servant. The only people who served were people were people too weak to do otherwise. Today you might see a photo op of a State Senator with sleeves rolled up helping out with hurricane relief, but not in the ancient world. There were servants for that sort of thing. And then Jesus comes on the scene as a Suffering Servant. He’s like guys, if you want to be first, make yourself last for others. And everyone’s like, wait Jesus, I think we misheard you back here. I know I’m not first, but I’m not last. You mean somewhere in between the two, right? He’s like no, if you want to be first, make yourself last. If you want to be powerful, make yourself weak. If you want to be rich, make yourself poor. If you want to gain, lose. If you want to be great? And what made His message so mind-altering, so earth-shattering, was it wasn’t just a message He taught, it’s a message He lived. Jesus got up from the meal, took off his outer clothing, and he wrapped a towel around his waist. So he strips off any type of clothing that would distinguish him as a teacher or a rabbi. This is the modern-day equivalent of taking off his tie and suit coat and putting on holy jeans and grass stained shoes. Now this basin is the bowl that was used by household servants to wash the feet of those who owned the house. Walking in sandals on dusty roads used by animals meant you’re your feet would end up looking repulsive. So disgusting was the job of washing feet there was a law in Israel that a Jewish servant couldn’t wash the feet of another Jew. It was considered too disgraceful, so the job was reserved for only non-Jewish servants. Anyone want to come up here? Super awkward, right? Make it stop, Chris. “Do you understand what I have done for you?” he asked them. 13 “You call me ‘Teacher’ and ‘Lord,’ and rightly so, for that is what I am. 14 Now that I, your Lord and Teacher, have washed your feet, you also should wash one another’s feet. 15 I have set you an example that you should do as I have done for you. 16 Very truly I tell you, no servant is greater than his master, nor is a messenger greater than the one who sent him. But Jesus isn’t done. In a few hours, this man who took off his robe would be stripped of his clothes and die a criminal’s death on a cross. but forsaking himself for the sake of others. Jesus says He died in your place. Jesus says He died for your sins. And His example so-motivated his friends and followers, the transformed the world because they would call themselves, get this, servants for Christ. They traded their togas, their robes, their crowns, their jewelry, and became known as servants. They wowed the world, not with their knowledge. Not with their morality. They turned the world upside down with their love. Their service in Jesus’ name. And people were like, You shouldn’t serve me, I’ve done nothing to deserve this, tell me more about this Jesus you follow. And within 100 years, there were millions of servants of Christ, all across the western world, serving as they had been served. If you would’ve asked people in the first-century who had been served by a Christian, they would’ve used one words to describe them: servants. Think you’d get that answer if you asked people to describe Christians today? You’d get bigots. Hypocrites. Moralists. I’m not so sure you’d get the word, servants. I mean, if you aren’t a Christian, isn’t this one of the things that bothers you about Christians? That they claim follow a guy but do nothing to live like Him? You’d be right. And we need to confess to you that we have not loved or served in the way of Jesus, and we need your forgiveness. And as we move forward from here, at least in this church, we intend to change some of that. That’s why I’m so excited about what we’re going to do next month. As you can see in the back of the church one of our visions is to be a church that prospers the city. That means that we intend to not just coexist in this community, we intend to transform this community. And next month each of our small groups are going to become Prosper the City Teams, and will take three weeks to come up with a service project to make an immediate impact in our neighborhoods in the last week of October. And I would love for you to be a part of it all. Sometimes it’s hard to know how to “serve in the name of Jesus”, and this is a chance to do just that. All you have to do is fill out one of our Connect Cards and check the box that you’d like to join a Prosper the City Team. In just a moment when we collect our offering, just drop this contact card in the bucket as it passes by and we’ll get you plugged in. What do you think will happen when our city is touched again with service like the church used to do thousands of years ago? Don’t you think it will be changed? Don’t you think people will appreciate it? They may not agree with what we think about Jesus but they will not argue with what we do in His name. But that’s not all that will happen. You know what will happen when you put on the work gloves for an afternoon next month and serve? You’ll be blessed. Personally. Not in a financial way (the early church lost their homes.) Not in a good parking spot sort of way. (the early church lost their lives). But in some sort of Divine transaction of purpose and joy and contentment, you will be blessed.